In loving memory of my wife. Margaret Sutherland died at Benechielt 15th October 1915 aged 41. 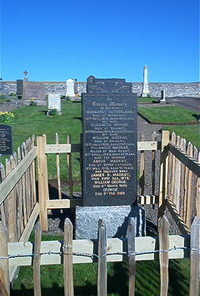 Husband Angus Mackay died at Upper Latheron 9th May 1956 aged 75. Wife Elizabeth McIvor died at Golsary 20th March 1953 aged 53. Son Pte Angus Mackay killed at Wadi Akarit 6th April 1943 aged 22. Son James D Mackay 23rd December 1978. Son William George Mackay died 6th March 1986. Son George Mackay died 5th February 1988.